Are you planning to get a backpack camera bag that will allow you quick access to your camera while keeping it safe from the elements? Consider the G-raphy Camera Bag Backpack. which comes with a free rain cover. The durable material is matched with reinforced stitching so that you don’t need to worry about ripping and tearing at the seams, which are usually the weaker points on these types of bags, especially since they carry many heavy objects. The bag itself is made of weather resistant nylon which is water repellent and resilient against abrasion and damage. The material is durable enough to store everything that you need from the camera body to lens, to a flash and tripod. You can carry your gear knowing that it’s adequately protected. If you often find yourself shooting in the great outdoors, you might want to find a bag that can keep up such as the G-raphy Camera Bag Backpack. It comes with its own rain cover that reinforces weather protection for all of your expensive gear. Inside, you will find adjustable padded dividers that you can customize depending on the gear that you plan to bring along. You can adjust it depending on the size of the gear that you carry. No matter the occasion, the type and environment of the shoot and the actual gear that you need to bring along, this bag will be able to comfortably accommodate everything that you will need for any specific event because of the adjustable compartments. Because you are able to customize the padded dividers within, you can be assured that no matter how much you move around while carrying the backpack, your equipment will not be knocking against each other and causing scratches or dents and even cracks. Your items will be protected not only from the external elements but also from each other from within the pack. At its optimal capacity, you can fit a DSLR camera with an attached lens plus three to four additional lenses, depending on what sizes of lenses you carry, a shoe mount flash and a tripod. That is basically everything that you may need for a shoot. So if your shoot calls for a different type of lens, you can come ready because you can bring more than just one or two. You can have easy and safe access to all of your gear through a unique side entry that protects your gear against theft and gives you better access than a traditional backpack would. 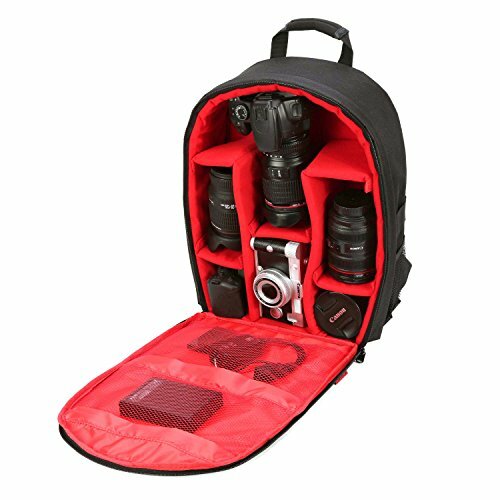 What makes this camera bag special is its quick response/release feature that keeps your camera safe and protected and keeps your accessories organized and easily accessible so that you can quickly get your camera out when you need it. This makes this bag the perfect camera pack for photojournalists or news photographers who need to be able to access their camera quickly at any time. This will enable you to capture anything and everything quickly so that you do not miss a single thing. To ensure full customer satisfaction, the G-raphy Camera Bag Backpack comes with a 90-day guarantee. This way, you can enjoy full customer service and you can fully attest to the quality of the product that you have bought. It is fully compatible with most DSLR type cameras such as Canon, Nikon, Pentax, Sony, Olympus, and much more. This backpack can even double up as a normal backpack for everyday use such as for school, or for adventures such as for hiking, traveling or camping. It is indeed a versatile piece that provides convenience and functionality. If you are a starting photographer or if you intend to use this bag for casual purposes then it will definitely do. However, professional photographers could argue that there are not enough pockets or storage places in the bag. The dividers are configurable and padded, but they are not stiff enough to maintain their position adequately to keep things in place all the time as you move. With all of the basic features that you would look for in a good camera bag, the G-raphy Camera Bag Backpack has it all. What is great about it is its quick-release feature and easy-access design so that even when it’s on your back, it is not difficult to access your camera and gear.